Not long now...are you ready for the 6th of May? 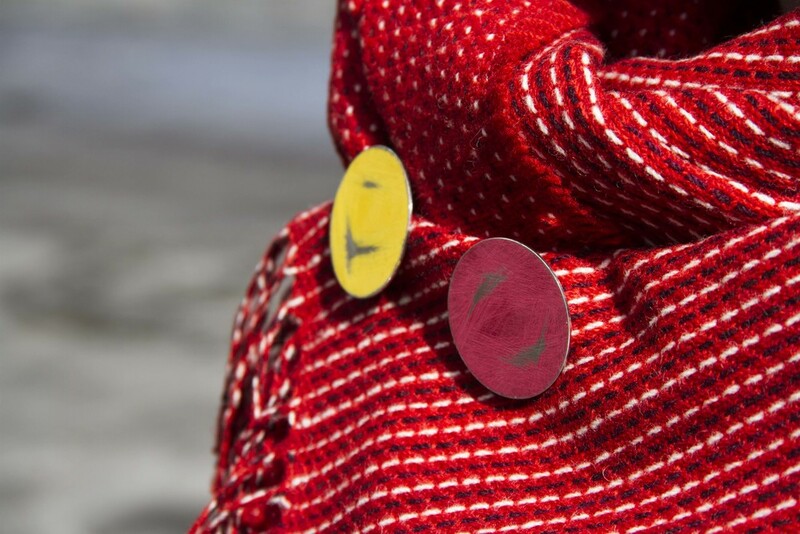 Next week we launch our exclusive limited edition brooches alongside Skye Weavers' Periwinkle shawls. With only 50 of each colour in the shawls and brooches available, don't hesitate to purchase yours before they all go! Meanwhile, since the last blog post, we have been beavering away finishing, photographing and releasing work in progress images on our Pinterest board to show the story behind our exciting collaboration! Follow Skye Weavers's board Periwinkle Shells on Pinterest. We had a few sunny days on Skye before the snow arrived this week to shoot with the beautifully finished shawls and brooches. Heading to Orbost beach, where Phil first took the photographs inspiring the project, we captured some beautiful shots of the landscape together with the products, something we all are inspired by. Alongside the launch of the products next week we are giving you the chance to win a shawl and brooch to celebrate this exciting collaboration project. All you need to do is share our newsletter through email, Facebook or Twitter using this LINK and the social sharing buttons located on the top right hand corner. Your name will be entered into a prize draw with the winning entry being announced next week on our homepage, facebook and twitter on the 6th of May with launch of our products. Good Luck! Thanks for reading and if you would like to be the first to know about the release of our exciting products then sign up to the newsletter on the homepage! 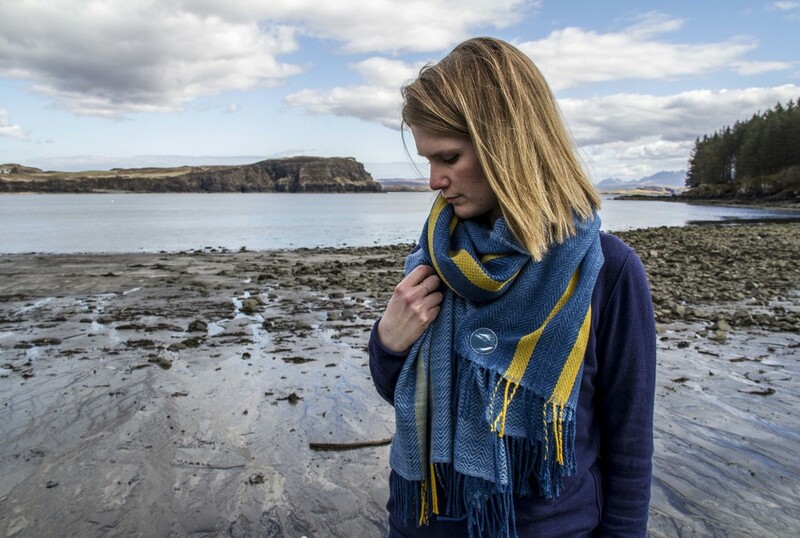 Periwinkle Shawls - An Isle of Skye Collaboration! This blog tells the story of two sets of three yellow sea shells, flat common periwinkles to be more precise. 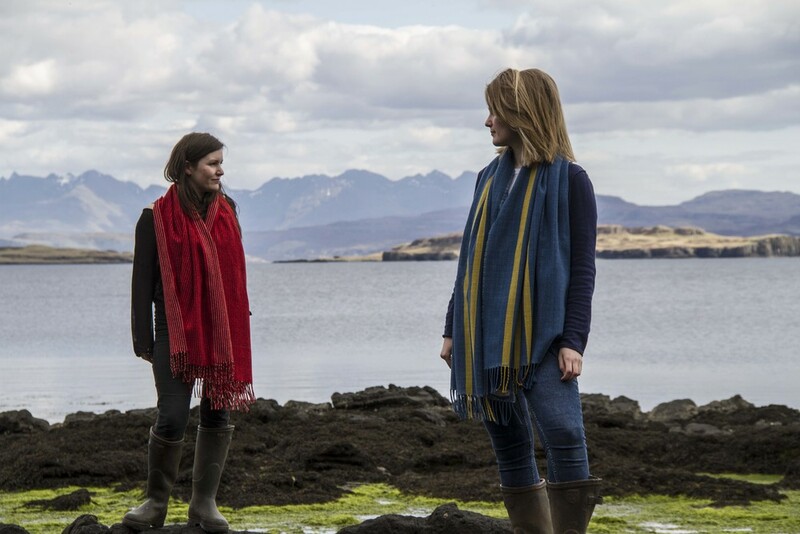 They are the starting point of a very exciting collaboration between four artists and makers working on the Isle of Skye. The first artist to introduce is Phil Gorton who is based in Roag. He is an analogue photographer who enjoys exploring the small and beautiful things on the Isle of Skye and other wild places. With his unusual perspectives and close-up photography he manages to capture colourful moments, intriguing shapes and dramatic light effects even on the most grey and monotone days. Skye Weavers are the driving force behind this unique collaboration. 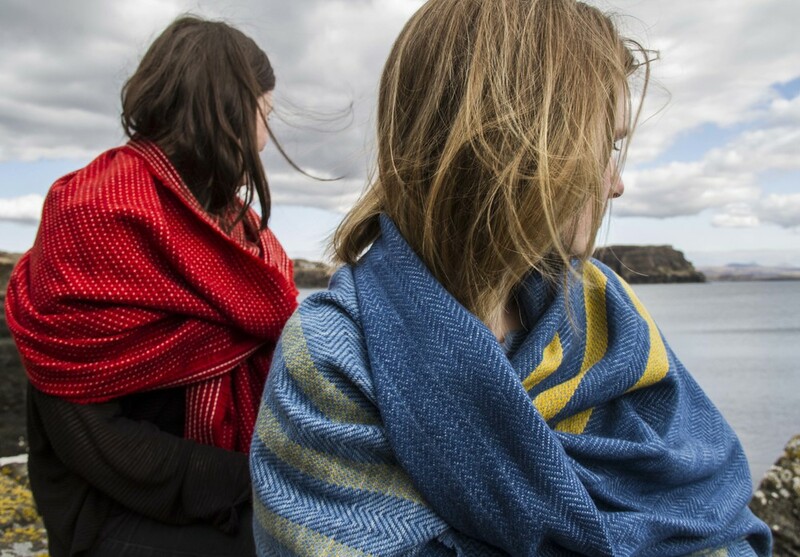 They beautifully reflect Skye's landscape in their weaving which is woven on a bicycle loom in a studio overlooking Loch Pooltiel in Glendale, the north of Skye. Their special interest relates to what Phil is doing in his photography - and they love looking at things in close-up! Tony and Eva Lambert of Shilasdair, dyed the lambswool yarn for the shawls using a variety of plant dyes. Their recipes have been developed over many decades and Eva explains what is special about natural dyes: "If you magnify a chemical dye, you'll only see one colour. If you magnify a natural dye, you will see that it is made up of a multitude of colours, which is what gives it its depth." And then there is me! I was fascinated by this project and joined in the latter stages of development. I have chosen 3 special colours to apply to my Buoy Brooches that will accompany the shawls. Like Phil and Skye Weavers I use my surroundings, especially the shoreline of Skye, to inform my jewellery. The repeated shapes and geometric forms in my jewellery are a statement as well as a reflection of shapes and forms found along the shoreline. Skye has such a rich plethera of makers and crafts people, hidden away in the furthest most remote parts of the Island. This collaboration is the perfect example of how makers on Skye overcome distance, weather and power cuts to inspire, create and work together on exciting projects inspired by Skye itself! SHELLS TO SHAWLS - The finished limited edition shawls and brooches as well as copies of Phil Gorton's photographs will be available to buy in my website and Skye Weavers in May. Until then we will be using a Pinterest board to log the development of the collaboration. Images of each of our locations, places of inspiration, processes and final pieces related to the project will be released each week. We will also be using a special hashtag #skyemakers across our social media posts on facebook and twitter. Periwinkle Shawls & Brooches will be available in May and in limited supply so sign up to my newsletter if you want to be first to know when these special pieces will be available to buy!